Hundreds turned out to Hillary Clinton's "get out the vote" event Saturday night in Portsmouth, New Hampshire. The main message? She says the most qualified candidate, but she needs New Hampshire's help. It's crunch time for the Clinton campaign as she holds events all over the Granite State in the days before the primary. "We are progressives and we know what it takes to get things done - that's why we want Hillary Clinton," Minnesota Sen. Al Franken said. 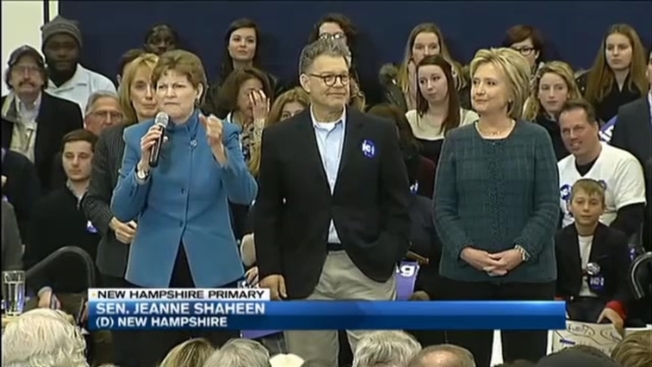 Big names joined Clinton on the campaign trail, including Franken along with New Hampshire's Sen. Jean Shaheen and Gov. Maggie Hassan. An enthusiastic crowd acknowledged it's an uphill battle in New Hampshire - Clinton is still trails Bernie Sanders by double digits, according to the latest NBC poll. But campaign volunteers are hoping to help her close the gap - including a group of 80 people from Arkansas, who have been going door to door. "We are going to send her out of New Hampshire with good, strong momentum," Shaheen said, "and surprise the pundits on Tuesday." Clinton outlined her goals as president - raising wages, creating universal health care, creating coalitions in the Middle East - saying no Republican candidates come close to her experience. "I get the anger and the frustration, but it's not a plan or a strategy," she said. And only once did she mention Sanders by name. "We had a little back and forth about being a progressive," she said. "I think a progressive is someone who makes progress. And for me, there is so much progress to be made."